It’s been five years since the last ag census. Since 2012, the U.S. has lost about 70,000 farms, saw the average age of farmers go up and prices for certain commodities go down. But it’s not all bad news: More rural areas are connected to the internet, something that’s a priority for the U.S. Department of Agriculture, which gathered the data from farmers and producers across the U.S. — as long as they earned more than $1,000 and grew a federally recognized crop (i.e. not cannabis). Here are some maps and charts that outline some of the main takeaways. The average age of farmers has gone up by 1.2 years to 57.5 years old. It’s the continuation of a long-term trend, showing farmers are hanging on longer and making it harder for younger farmers to get into the the industry. 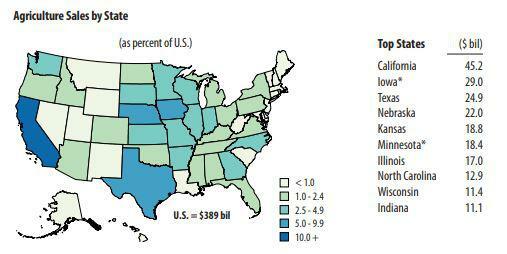 Farmers in the Midwest and Colorado skewed slightly younger. The dairy industry saw a sharp decline in the number of total farms — nearly 9,500 fewer than there were in 2012. However, the overall number of dairy cows grew slightly. That suggests consolidation in the industry and a willingness to increase a herd to turn a profit at a time of low milk prices. California dominates the ag sector, with its top-producing county (Fresno) getting more sales than 25 states combined. That said, Midwest states continue to produce more acres of soybeans and corn while production of other grains, like wheat and barley, has dropped significantly. As a part of the Trump administration's agenda to revitalize rural economies, the USDA recommended improved access to infrastructure, specifically high-speed internet. In 2017, 75 percent of farms have access to internet compared to 70 percent in 2012. There were nearly 70,000 fewer farms in 2017 than 2012. Most of that farm loss came from mid-sized farms between 10 and 2,000 acres — farms that fall into the middle-income category, making between $2,500 and $1 million a year. 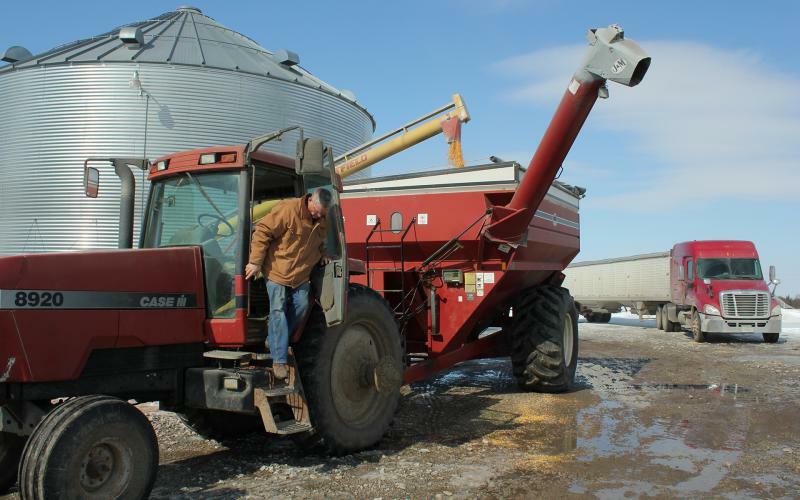 There was some growth in the number of small farm operations that make less than $2,500 a year and large-scale operations making more than $5 million a year, again pointing to industry consolidation. 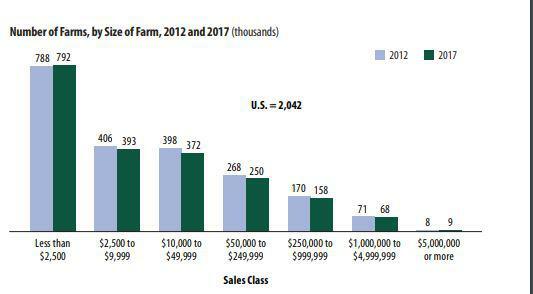 While fewer than 1% of farms made more than $5 million a year, those farms had 35% of all sales. Farms that made less than $50,000 a year made up two-thirds of all farms but only 3% of all sales. To read the full report, go to www.nass.usda.gov.